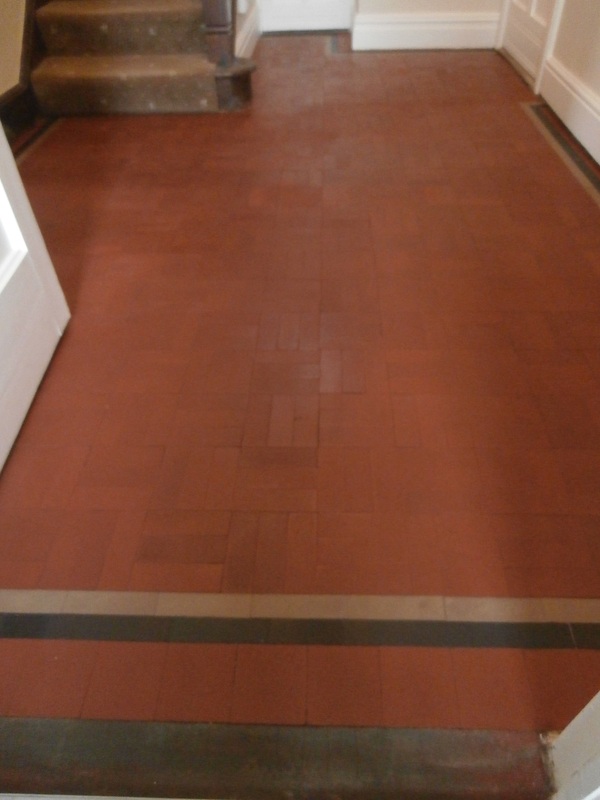 We were recently asked to restore an old tiled floor that had been laid in a Basket Weave Pattern in the hallway of a property in Torver which is a small hamlet on the outskirts of Coniston Water in the Lake District. Torver has a long history however it really took off with the arrival of the Coniston to Broughton-in-Furness railway line in 1859 which was used to transport stone and Slate from the local mines. Many of the properties in the Coniston and Torver areas date from the Victorian period and contain original stone and tiled floors. 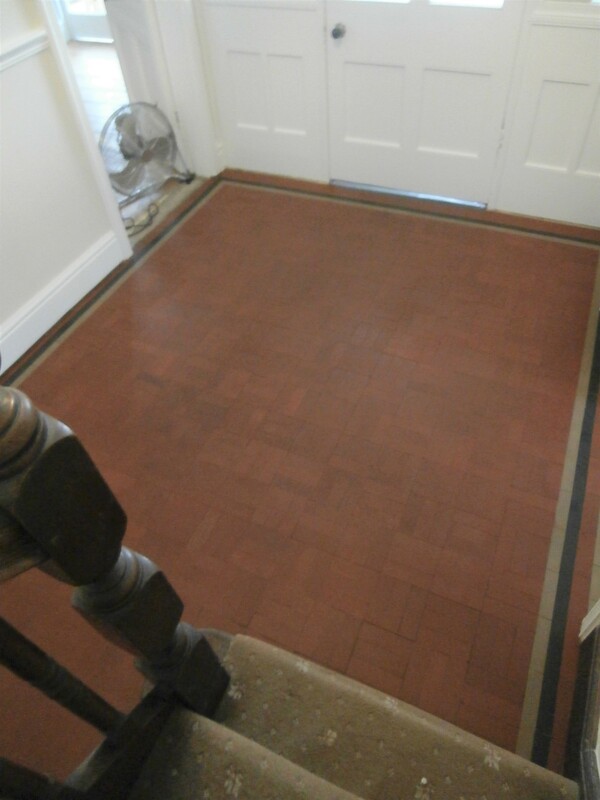 This tiled floor had been revealed when the existing carpet was removed by the new owners. It proved to be in quite good condition despite being covered for a long period, but it nevertheless suffered from the usual age-related issues. It needed an intense clean and a fresh seal, including the removal of deeply ingrained dirt, paint stains, glue deposits and bitumen. After inspecting the situation, the quote we offered the customer was accepted and a date was arranged for us to return to complete the work. Our first course of action was to clean the edges of the floor, to remove the glue deposits and carpet underlay residue. 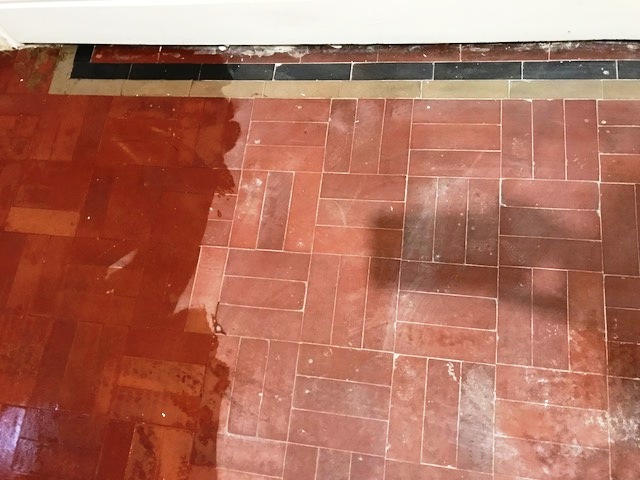 This was achieved using the careful application of a sharp scraping tool and handheld burnishing blocks combined with a couple of Tile Doctor cleaning products. The first product applied was Tile Doctor NanoTech HBU (Heavy Build-up Remover) which is a strong alkaline product specially formulated with nano-sized cleaning particles to penetrated deep into the stone and dissolve deeply ingrained dirt and stains. The second product was Tile Doctor Remove and Go, a heavy-duty coatings remover which works well particularly well at removing glue deposits, paint, and synthetic coatings. We then addressed the rest of the floor using a coarse 200-grit burnishing pad attached to a slow speed rotary cleaning machine, applied with water as the lubricant. We used this in small areas to intensely clean the surface of the floor. The resultant slurry was then extracted from the floor a powerful wet vacuum. The floor was then rinsed again with water and the moisture was wet vacuumed before we moved onto the next area. Once the floor was completely scrubbed and rinsed, and any remaining glue and paint issues were retreated using the same methods we used on the floor edges, we then moved onto the final phase of the clean. The last step in the cleaning process involved giving the floor an acid wash to deal with any potential salt issues (efflorescence) which can result in white salt deposits appearing on the surface of the tiles as they dry. Damp proof membranes that can prevent this problem are a relatively modern invention, so this can be a real issue for old floors from the Victorian era, particularly if the floor has had damp issues in the past. The floor was washed with a 1:3 dilution of Tile Doctor Grout Clean-Up which being acidic effectively counteracts the alkaline salts. The floor was then given another rinse to remove any trace of cleaning products and then left to dry off. We actually left the floor to dry out for three full days and upon our returning to the property several moisture readings were taken to ensure the floor was dry enough to take a fresh seal. The customer had requested a natural-looking matte finish to the floor. We have the perfect product to provide this type of finish, so we proceeded to apply three coats of Tile Doctor Colour Grow, an impregnating sealer which naturally enhances the colours in the tile, additionally it’s a fully breathable sealer so moisture can easily rise through the floor. 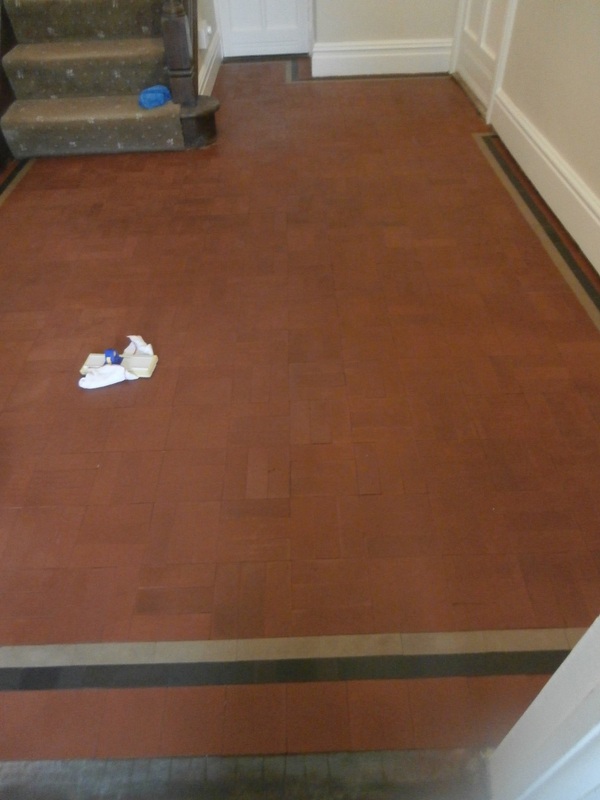 As you can see from the photographs taken during the various stages of the restoration, the intense clean and fresh seal greatly enhanced the appearance of the floor – much more so than could have been achieved with everyday products and methods. The customer was very pleased indeed.